Are you searching for the secrets to being strategic, effective, and happy in your nonprofit communications work? Look no further. You'll find the answers inside. 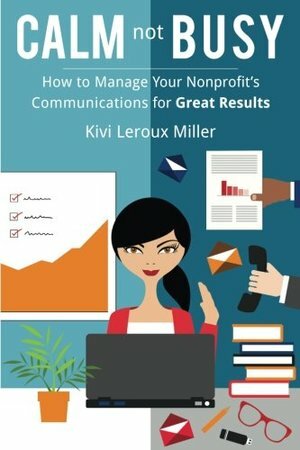 Kivi Leroux Miller -- whose previous books, The Nonprofit Marketing Guide and the award-winning Content Marketing for Nonprofits, are considered "the bibles" of nonprofit marketing and communications -- reveals what she's learned from coaching hundreds of nonprofit communications directors and teams. Effective nonprofit communication is about much more than list targeting, relevant messaging, email open rates, and social media scheduling. The most successful communications directors and teams are those who are Collaborative, Agile, Logical, and Methodical. They are CALM. Inside: • Take the CALM not BUSY Assessment to get your personalized CALM Score. • Learn how simplifying your communications work makes you more strategic. • How to lead others through good communications decision making. • How to minimize the chaos, busyness, and stress so you enjoy the work more. • How to apply CALM not BUSY to real-world situations.